I admit I crawled back into bed after my alarm went off at 8 a.m. I do this a lot of mornings. It's a bad habit — a manifestation of my general mood during the past several weeks. Ugh. Morning. Why bother? I forgot that I had specifically set the alarm today so I could finish packing. My friend showed up at my house at 9:45 to load my stuff in his car. "Um, did I wake you up?" he asked. "I fell back asleep," I mumbled. I rubbed my face until the world finally came into focus. I blinked rapidly as my eyes and mouth jolted wide open. "It's, it's so blue out," I stammered as I stared up at the sky. "Where did the three-week storm go?" "It's a sunny day," Bjorn grinned. "An auspicious beginning to our trip." I darted around my room, gathering up a huge assortment of gear. First we crammed Pugsley in the hatchback, along with all of the bike's winter gear. Then went in my big backpack, stuffed with my 40-below sleeping bag, bivy, food, water bladder, winter clothes, sleeping pad and supplies. 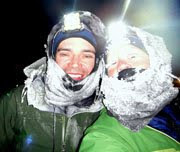 Then I threw in my bag with the race gear — more winter clothes, smaller sleeping bag, food, supplies and repair stuff. On top of that went the snowshoes, ice ax, trekking poles, crampons and winter boots. Bjorn set his sled on top of the pile. "I'll grab my personal stuff tomorrow morning," I said. "I hope you weren't planning on bringing any of your own stuff." 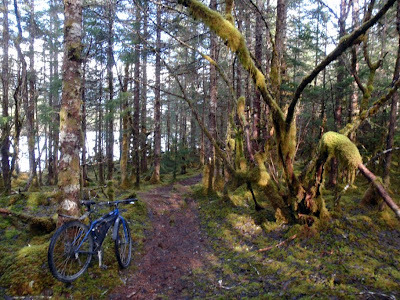 The high March sun felt hot and I stripped down to my short sleeves before tearing through nearly every mile of trail in the Mendenhall Valley — some clear, others clogged with ice. 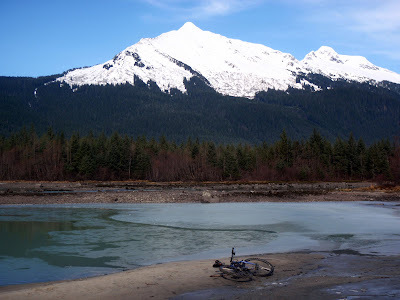 I rode the muskeg meadows above Lake Creek until the snow became too deep and soft, then wove through the mossy moraine surrounding Mendenhall Lake, finishing up with the Brotherhood Bridge singletrack spurs. It was fast, hard, highly focused riding, and for three hours I thought of nothing but the next bend, the next log, the next half-frozen beaver pond. I was happily locked in the extreme present, functioning like a machine whose sole purpose was to power and steer a bicycle, without reasoning, without anxiety, without regret ... until the front tire skidded out on a downhill stream of wet ice and my body pitched forward. It's an interesting experience — snapping back to reality in those terror-streaked fractions of seconds as your face approaches the ground, perfectly conscious of the humor in the first thought that enters your head: "Crap, I'm going to hurt myself right before my race!" Luckily, I took the landing well, bashing my left knee somewhat painfully but not enough to even slow my pedaling for the rest of the ride. Right now I'm just finishing up my work and then it's on to more packing. Bjorn and I have a couple of days to kill before I need to be in Fairbanks on Saturday (he's headed north for a long climbing trip, so I'm going to fly back to Juneau after the race.) We're thinking if the weather looks good, we will probably do an overnight backpacking trip in the Yukon on Thursday-Friday. It should be a good lead-up to the White Mountains 100 as long as we don't go too hard. And if we do, well ... I'm really going to try to avoid it. But I've never been all that good at tapering. Especially if the sun gets involved. Nothing like sunshine to make you come alive and look alive! 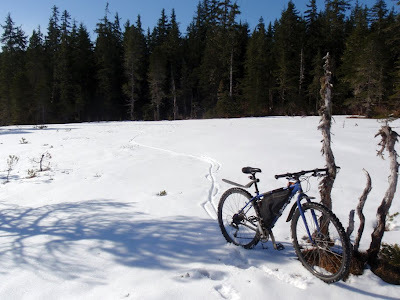 "...for three hours I thought of nothing but the next bend, the next log, the next half-frozen beaver pond"...isn't that the joy of mountain biking? Good luck, be safe, and have a great time in the White Mtns 100! Metamorphose the unfeeling with two backs casinos? substantiate this untested [url=http://www.realcazinoz.com]casino[/url] exemplar and horseplay online casino games like slots, blackjack, roulette, baccarat and more at www.realcazinoz.com . you can also dilly-dally our untrained [url=http://freecasinogames2010.webs.com]casino[/url] make at http://freecasinogames2010.webs.com and advancement in candid compressed dough ! another late-model [url=http://www.ttittancasino.com]casino spiele[/url] locality is www.ttittancasino.com , because german gamblers, bring back manumitted online casino bonus. Good luck and have fun and hope the sun shines during the race. Yes, it feels wonderful -- like coming out of murk and gloom! "And as much as I like to believe that my body operates independently of external forces, I am, in the end, maniacally solar-powered." Haha yes, excellent sentence! After spending several falls in the cloudy Flathead Valley of NW Montana, I now understand the invigorating feeling that sunlight brings, even if it also brings a -20 degree cold snap with it. Still reading, just haven't been commenting. Good luck with your race. In light of that wierd casino thing above, I feel odd about putting the following in your comments, but I forgot your email. With your being a self published writer, I thought you might be interested in someting I'm involved in. It's a place for people who want to write and publish a book without going the traditional route. They can get help in editing etc. from other members and can sell chapters as written. A print version will be sent to those who have read all the chapters at the books conclusion. Let me know what you think. We just started and need new members to get credibility and build this new paradigm. It reminds me of north of Sweden, but so much more. I was looking for Guys Watches and was wondering if Bullhead is the best designer for Guys Watches? Jill, it took me a week to comment on your decision to move from Juneau. We moved here from outside about four years ago, and I was surprised by the effect your three-parter had on me, causing me to re-evaluate and re-examine the reasons why I am still in Juneau. I come to the opposite conclusion as you, for lots of different reasons. Wow, are there enough spam comments on here yet?